It is ten to nine on a crisp January morning when my train pulls into Venice Santa Lucia train station. It is quiet, cold and the long platforms are empty. Only a handful of people get off the train and quickly walk through the station. I follow them slowly. 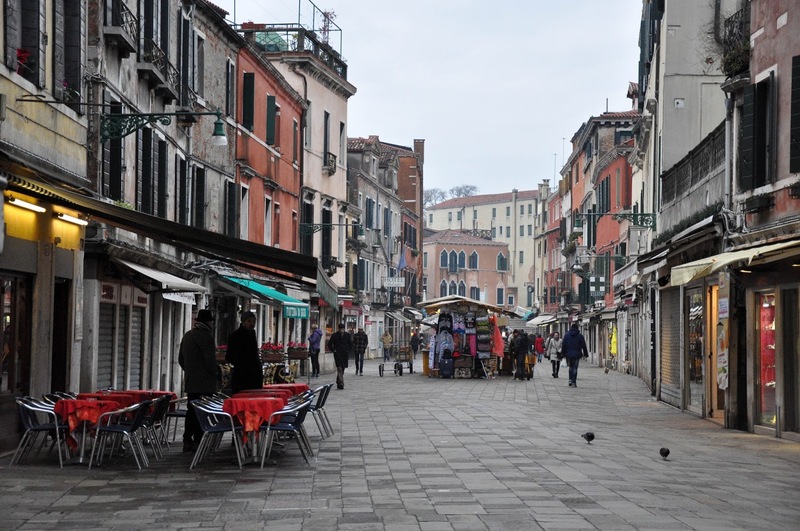 Santa Lucia – usually bustling with a constant flow of people and suitcases – is the quietest I have ever seen it. Shops and food outlets are open, but the crowd of shoppers is still missing. Outside, the sun is undecided. Having risen only an hour prior to my arrival, it feels distant, like its light is still travelling through time and space, making feeble attempts to reach me. 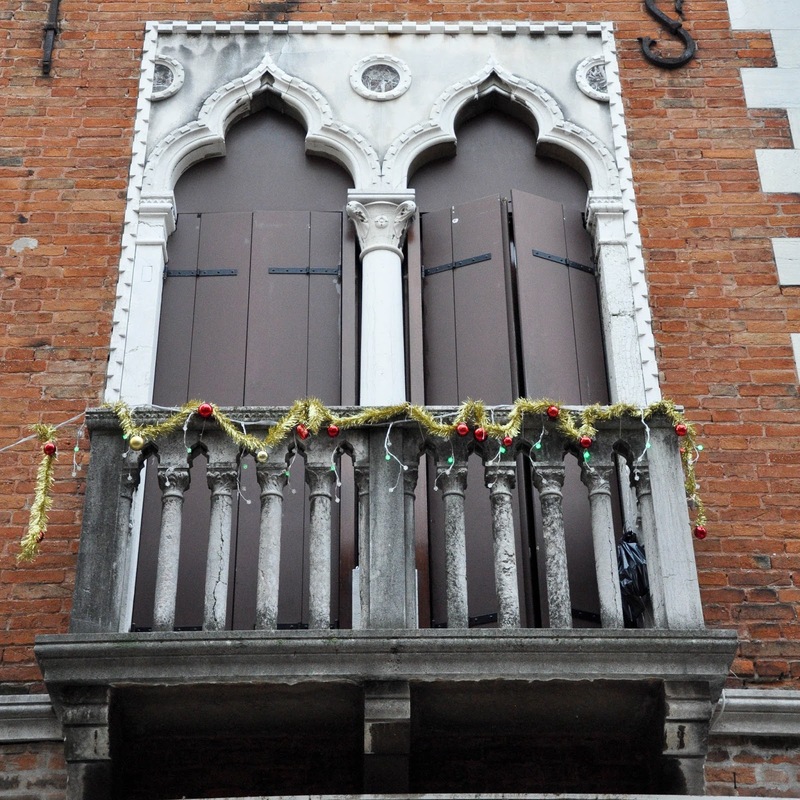 I am in Venice to see for myself its annual Befana race. Having arrived two hours before its start though, I suddenly have an idea. 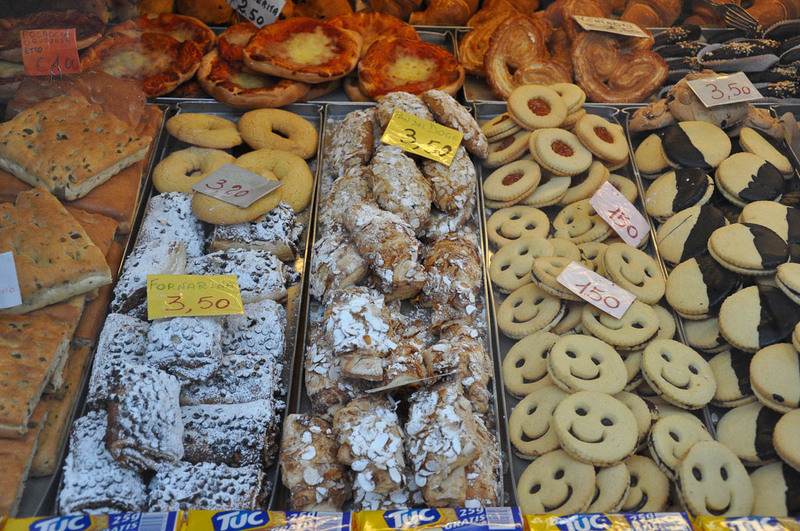 My original intention is to find a cafe and enjoy a cup of coffee and as many frittelle – fried balls of sweet dough with or without different fillings – as I can humanly have. 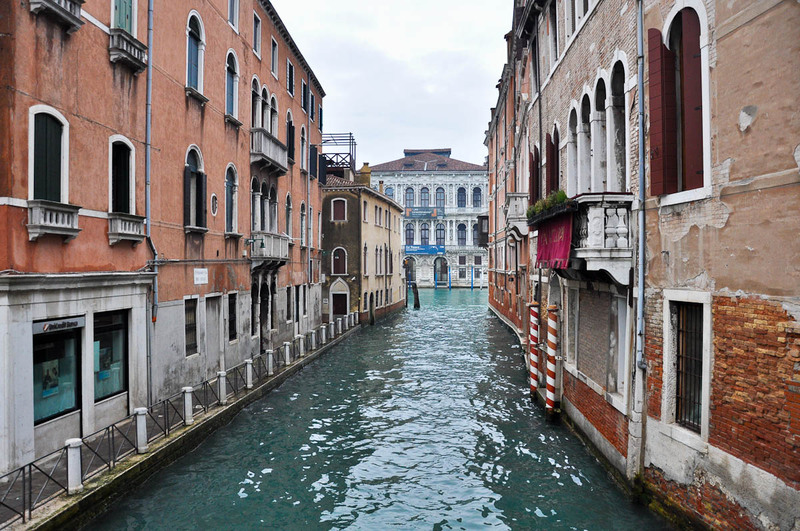 Instead, I decide to go for a walk and observe Venice just as she gets ready for the day ahead. 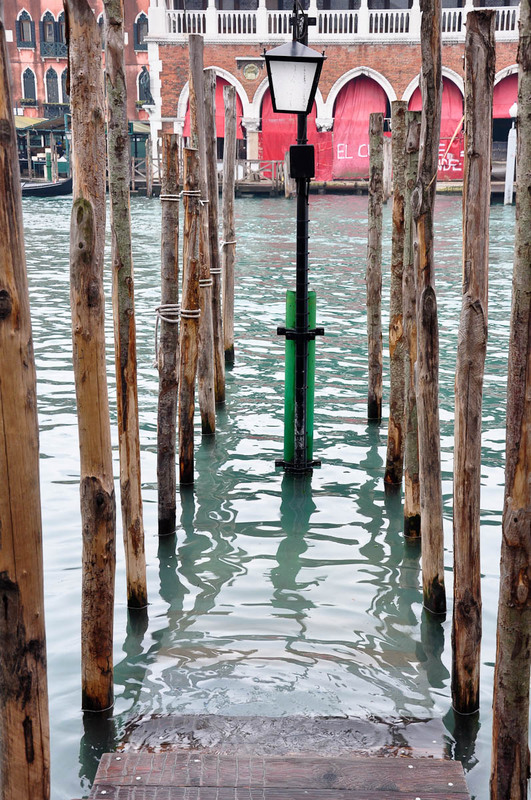 All my recent visits to Venice have been with a specific plan in mind. Which made me run around the place, breathlessly taking in museums, sights and events. So, nothing like having a free hour or two in order to re-acquaint myself with the city on water in the most authentic way – by observing its people, its canals and its streets early in the morning, still unperturbed by large crowds of invading tourists. I follow the wide street to the left of the station. Large signs affixed above shop windows point me in the direction of Rialto and Saint Mark’s Square. The window shutters of the flats above the shops are just starting to open slightly. 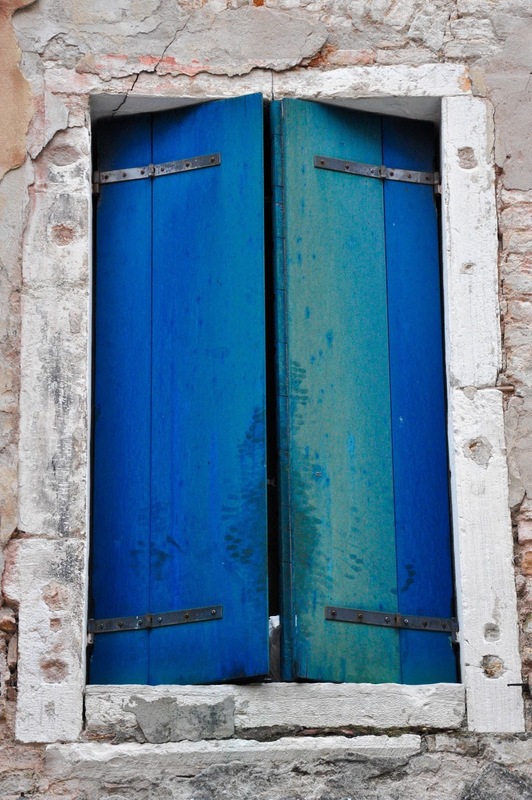 The faded colours of the shutters are offset by the peeling plaster of the Venetian houses. Cruel moisture rising from the canals claws non-stop at the walls and strips them, piece by piece until the bricks underneath are exposed. 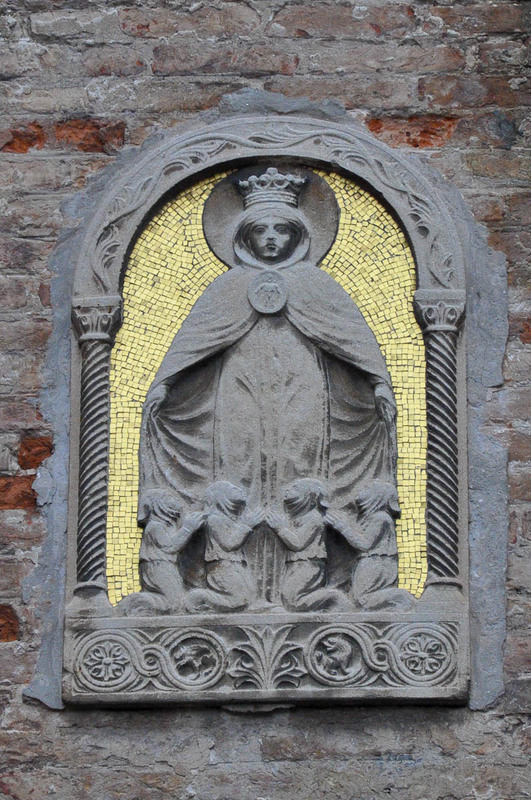 In spite of this, here and there, I notice sumptuous external wall decorations, like this lavish bas-relief of the Virgin Mary on a background of miniature gold tiles. 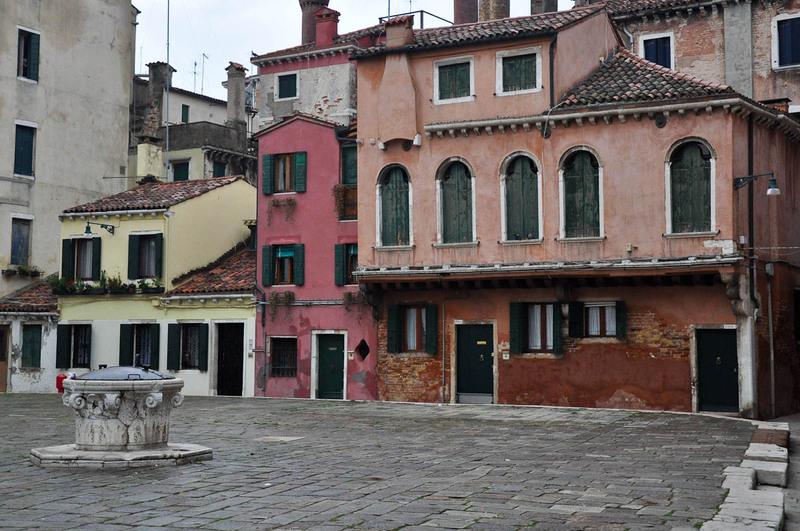 Even in its daily fight against natural decay, Venice is fabulous. I scale a bridge and a water view opens on my right hand side. 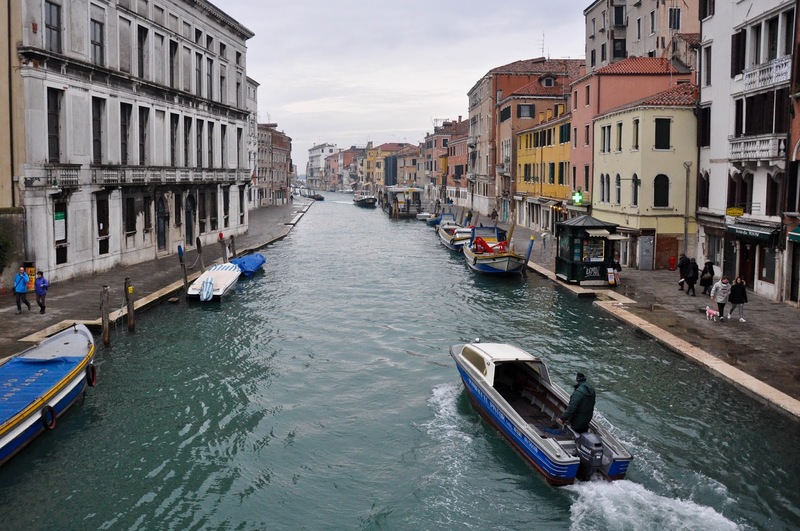 The narrower side canal joins perpendicularly the famous Grand Canal and right at the bottom stands upright the exquisite Ca’ Pesaro – a palazzo of white marble which dates back to the beginning of the 18 century. Nowadays it houses the International Gallery of Modern Art with a collection of paintings and sculptures of the 19th and the 20th centuries. I continue on my way when something else, yet again all white, catches my eye at the bottom of a side street. 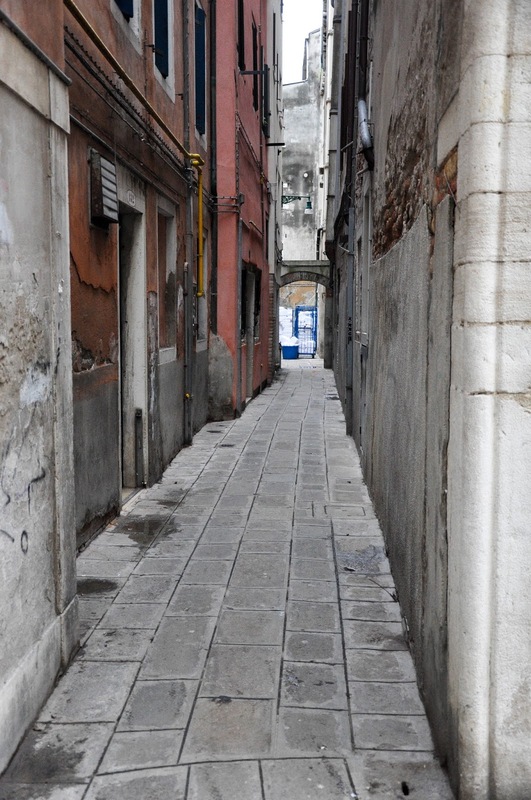 It is the same scenario – the tall walls of the adjacent buildings open just enough to allow a narrow passage at the end of which, instead of a white marble palazzo, I glimpse large piles of clean folded sheets. Neatly arranged in metal cages, they wait at the back entrance of a hotel for the guests to leave for the day, so that the chambermaid can make the beds. It is a strong reminder of daily life which is often only too easy to forget when you are faced with the wonders which Venice has to offer. I find it quite amazing how under the veneer of Venetian history, art, masks, Carnival, architecture, historical and sports events, scandal even, lies a layer of daily life, a non-stop struggle to adjust to existence on the water, to make sure that the city keeps ticking and tocking even when the most banal tasks, like collecting the rubbish, delivering goods or food shopping, take at least double the time and triple the effort. A motor boat for delivering goods shoots down the canal on my left hand side. 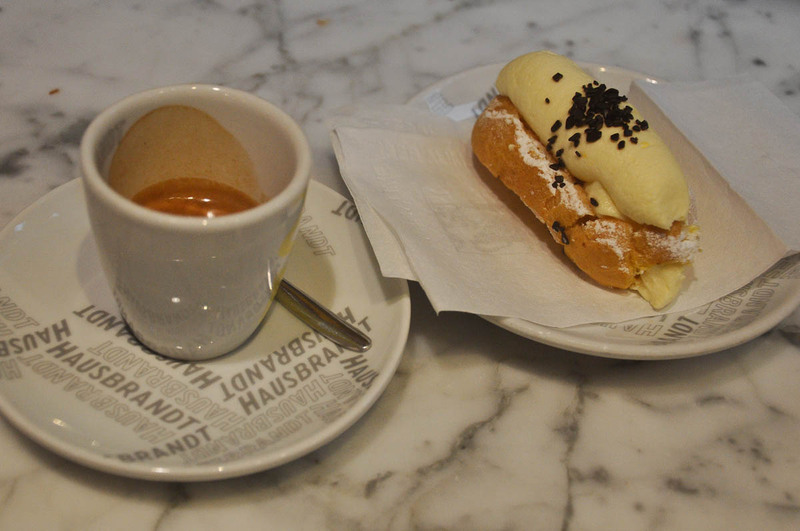 People pop in and out of cafes looking for a quick Italian breakfast of strong coffee and a brioche. 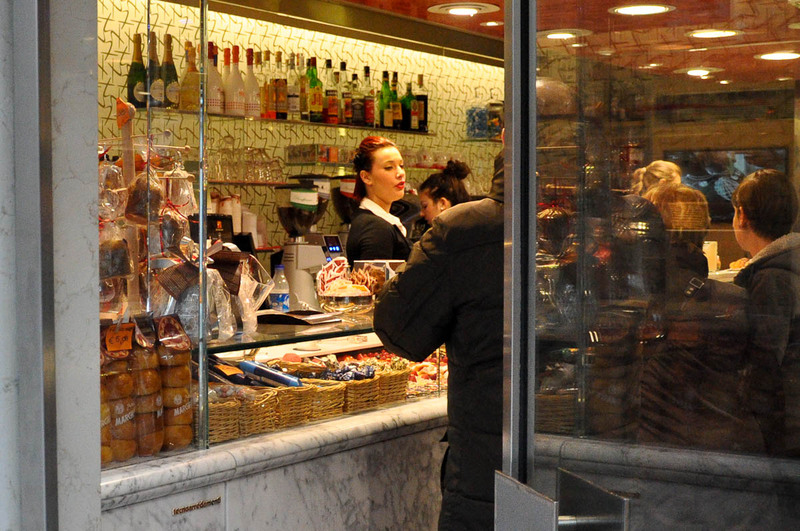 The window displays of the cafes groan under the heavy weight of sweet and savoury snacks. 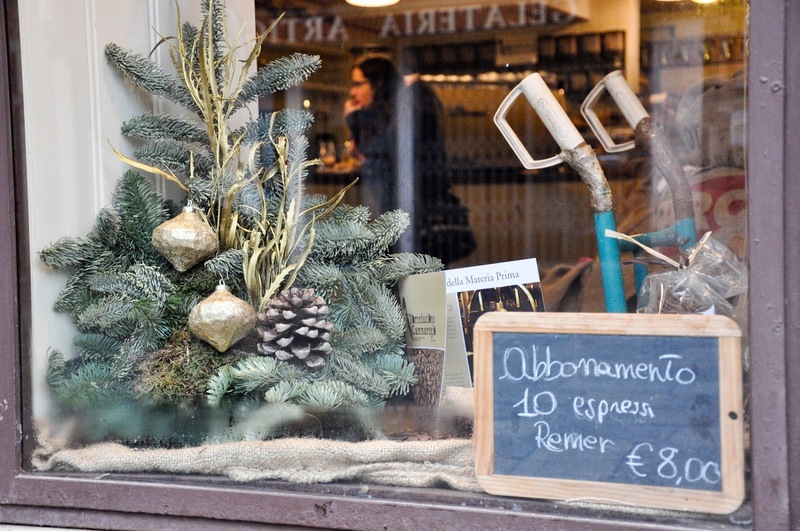 A discreet sign in the corner of the window of a nice-looking coffee shop advertises a subscription service. If you prepay, you can get ten proper espressi for only eight euros. 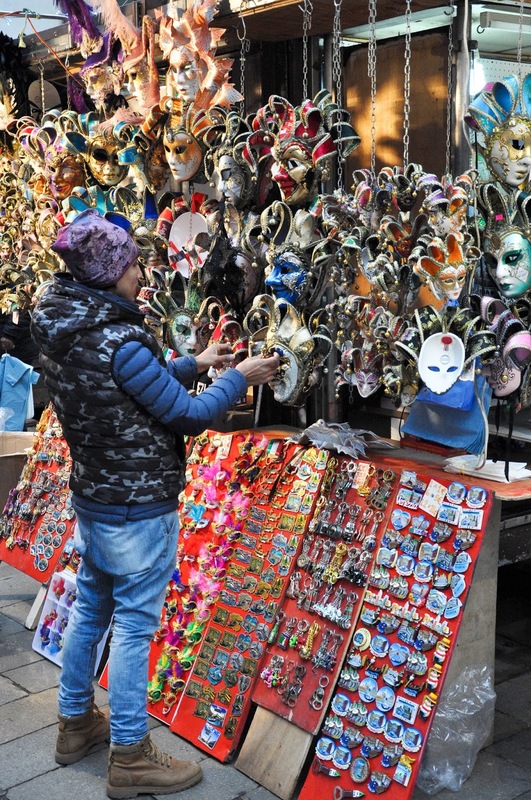 Street vendors set up their stalls with cheap imitations of Venetian masks and countless other not-made in Venice knick-knacks. 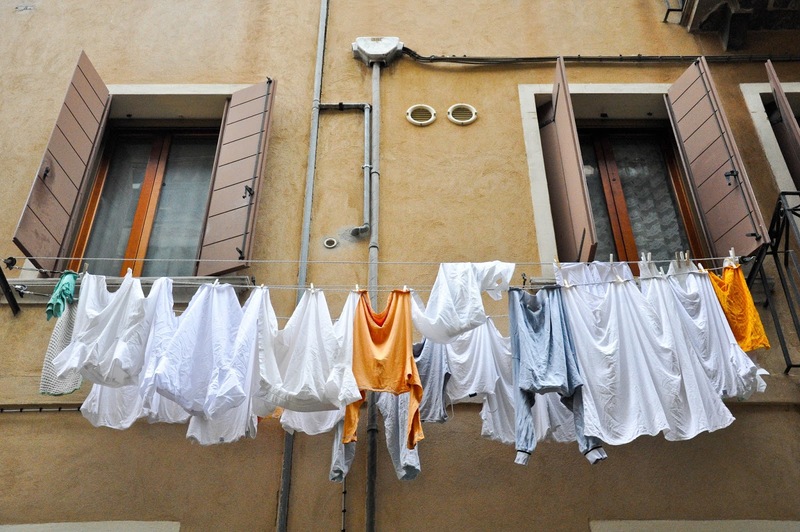 In the side streets freshly laundered clothes photogenically flap over my head in the cold morning air. The statue of a national hero looks solitary on a small square and I make a note of his name to learn his story later. 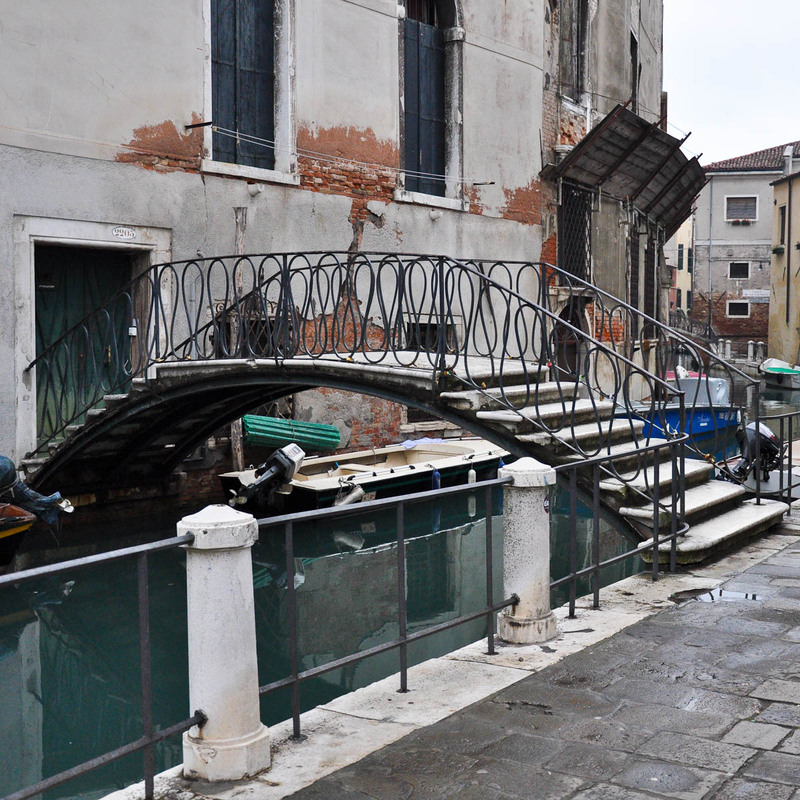 Small bridges lead to individual front doors, making sure that the inhabitants of the building can safely cross the bordering canal. 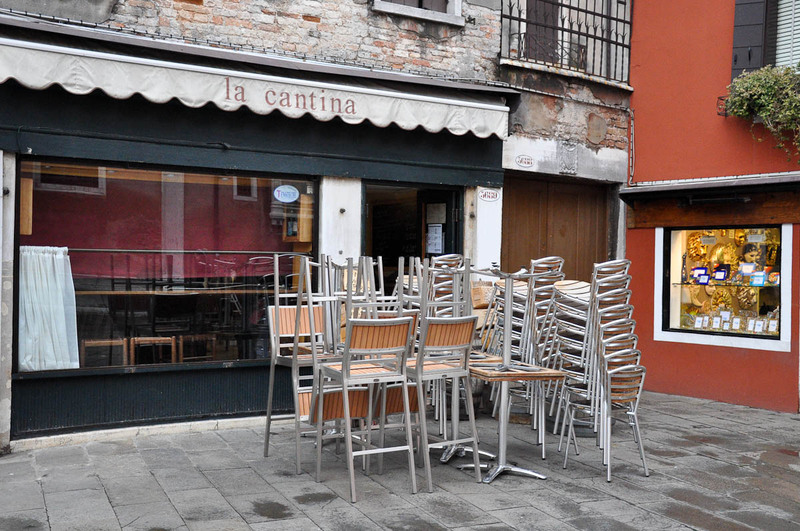 Upturned chairs rest on top of tables huddled together in front of small restaurants. They will remain closed until lunchtime. A small square just off the main street is completely deserted. A well sits in its middle, surrounded by houses, which are the definition of ‘higgledy-piggledy’. They seem to have been slotted where there was a bit of available space and then a second or third floor was added as the fortunes of their owners improved. The magnificent wall, surrounding what it seems to be a long abandoned palazzo, grabs my admiring glance. 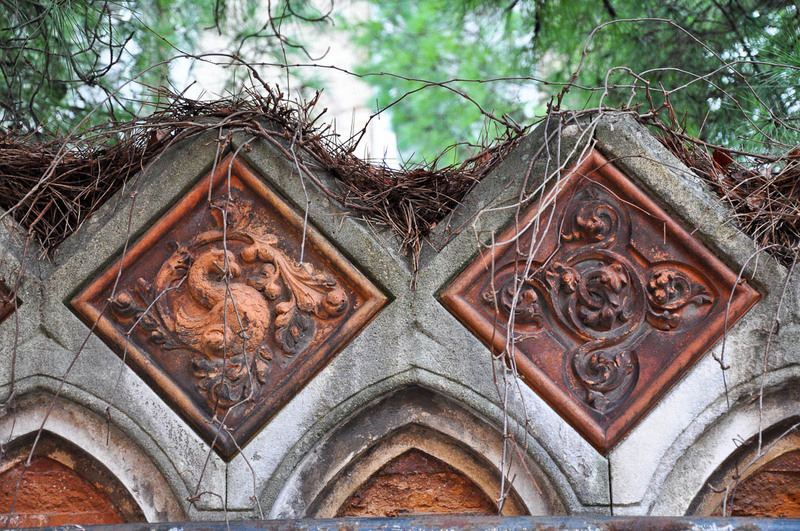 Beautiful ceramic tiles are built in the top portion of the wall, which is tenderly embraced by the dry branches of overgrown creepers. 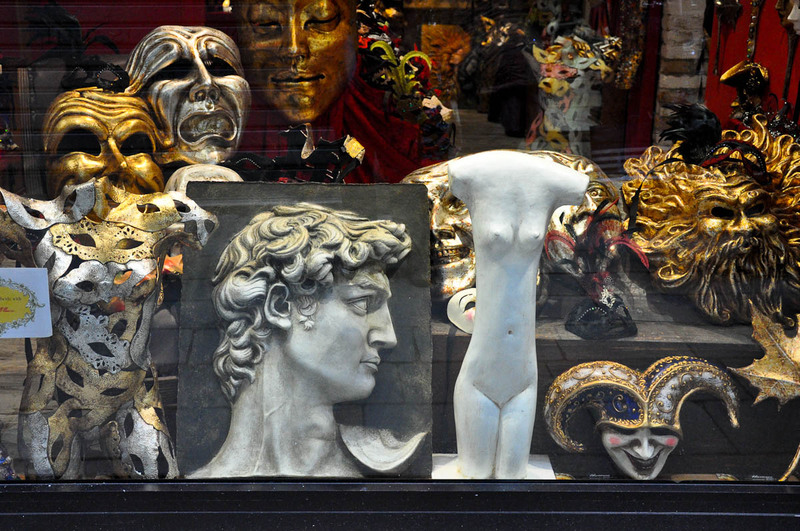 Shops for handmade Venetian masks open their doors for the yet to materialise hordes of eager tourists. 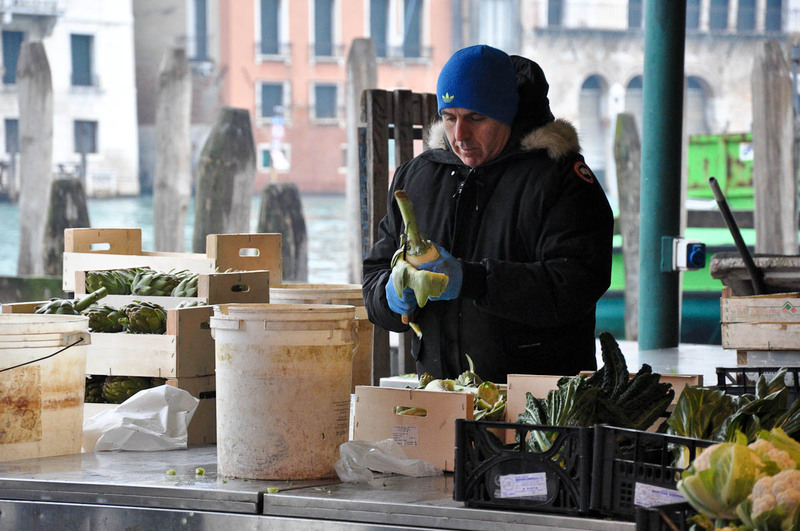 At Santa Sofia I take a traghetto over to the other side of the Grand Canal and end up walking through the famous Rialto market, where sellers of fruit and veg are still setting up their stalls. A seller cuts out fresh artichoke hearts. His hands work fast, skillfully holding the knife whilst turning the artichoke and separating the leaves from the soft and tasty white heart. He piles the green leaves and stalks in a crate, which will then be emptied in a metal cage on wheels. 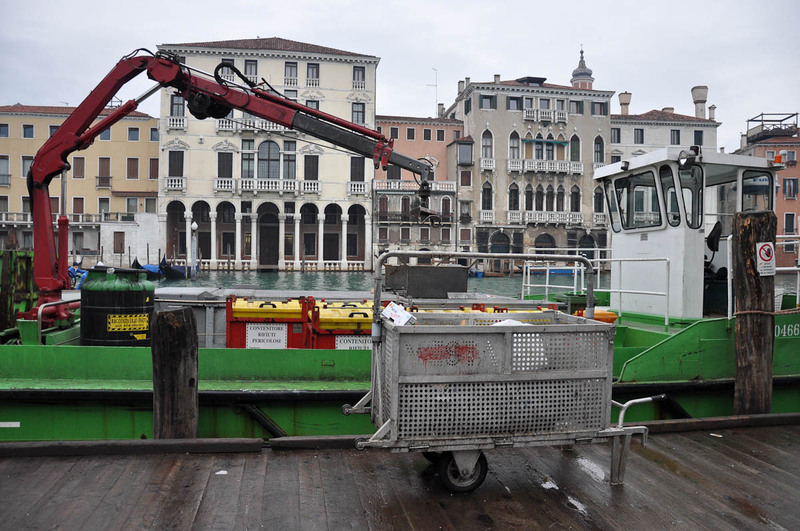 Workers, responsible for the rubbish removal in Venice, then will drag these movable wheelie bins to the nearest rubbish barge. 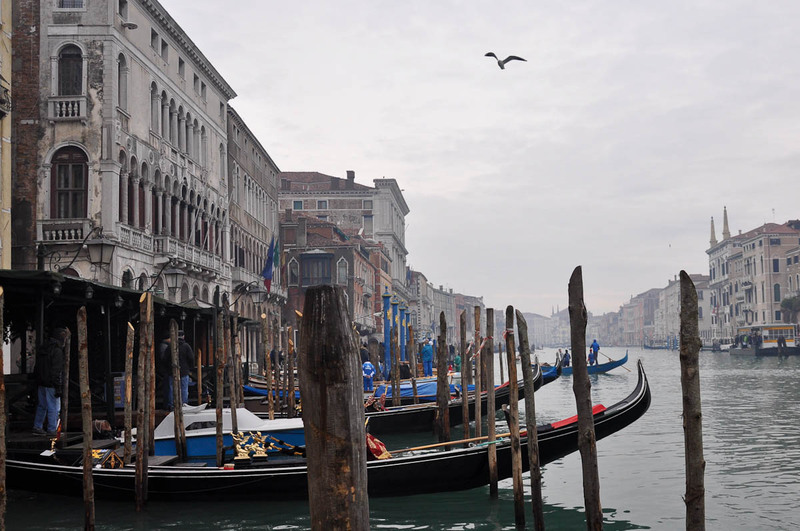 I saw at least a dozen such men working hard on the streets of Venice in the cold January morning. 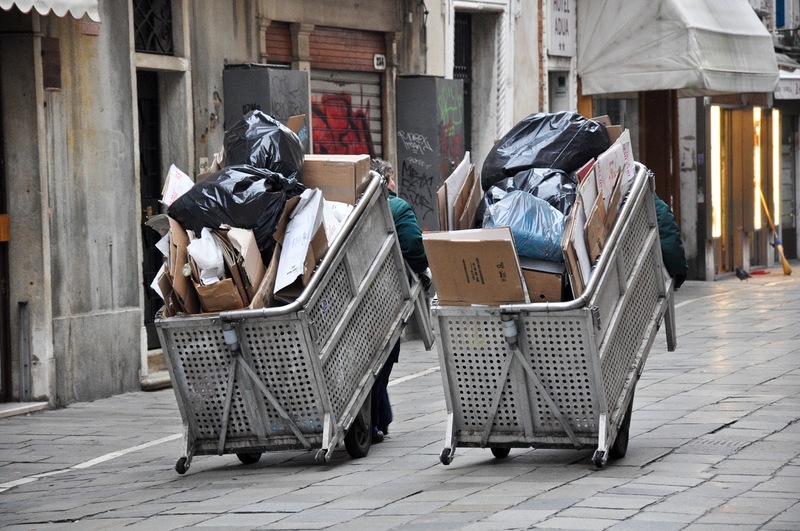 They went from door to door, picking the rubbish bags left there overnight by the shop and restaurant owners and by the residents of the palazzi and the wonky peeling buildings. Then they dragged the metal wheelie bins down the street and up and down the different bridges. A barge, moored on the side of a canal, has a crane attached to it which lifts the bins and carefully places them one next to another on the bottom of the barge, ready to be taken to the nearest rubbish processing plant. 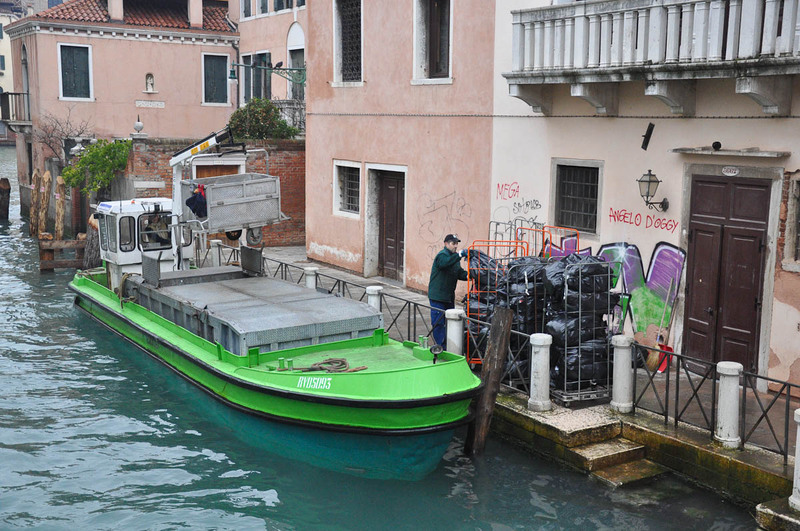 Another such barge is moored just in front of Rialto market. 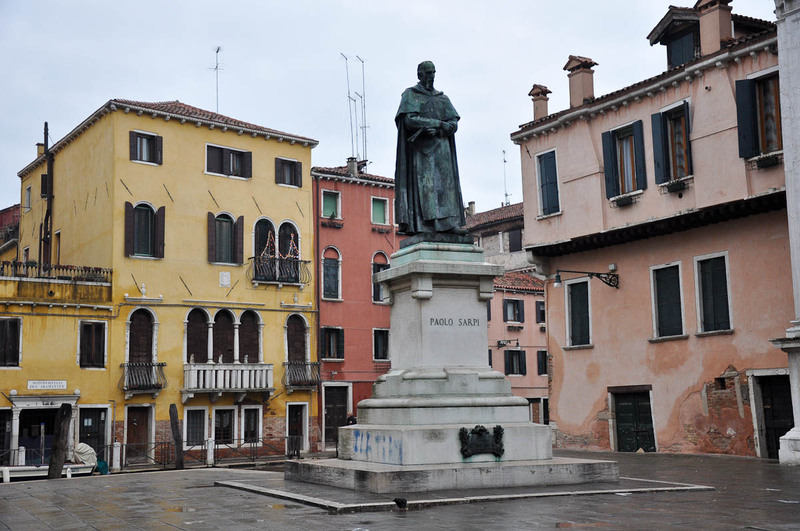 I continue walking and pass by San Giacometto Church – allegedly the oldest church in Venice. Right in the middle between Rialto market and Rialto bridge, the church overlooks a picturesque square which is usually bustling with people. Not so much early in the morning. 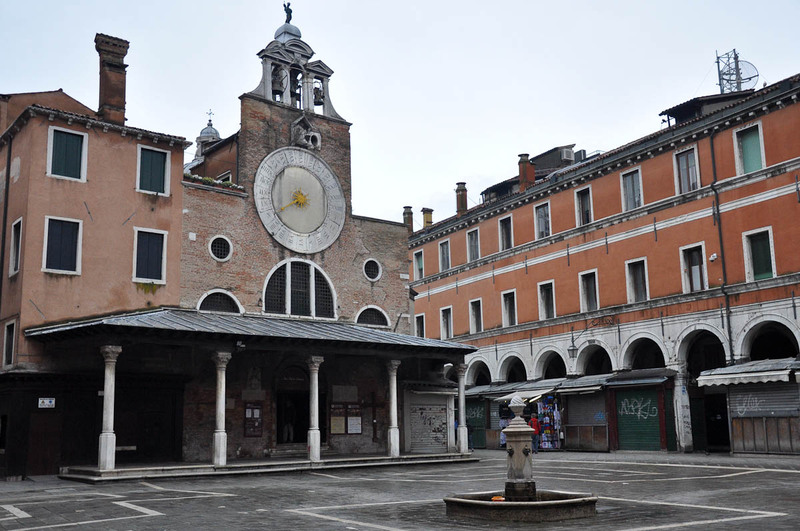 Save for a pigeon or two, the square is empty and I take my time taking it all in, not least the church’s gothic portico, one of the few surviving examples in Venice. 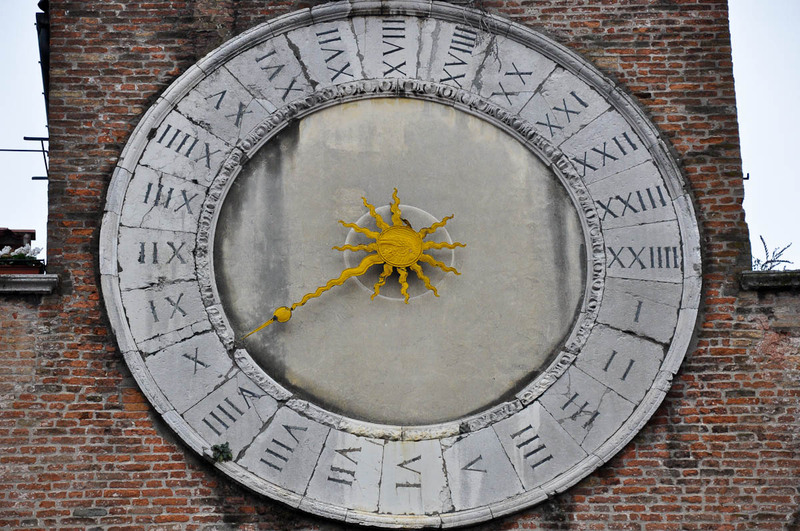 The church’s clock is quite unique, too. A single hand indicates the time on the 24-hour dial, but it is historically known for its inaccuracy, so don’t use it to set your watches. I reach the foot of Rialto bridge and instead of crossing over to the other side, turn right and walk along the edge of Grand Canal. 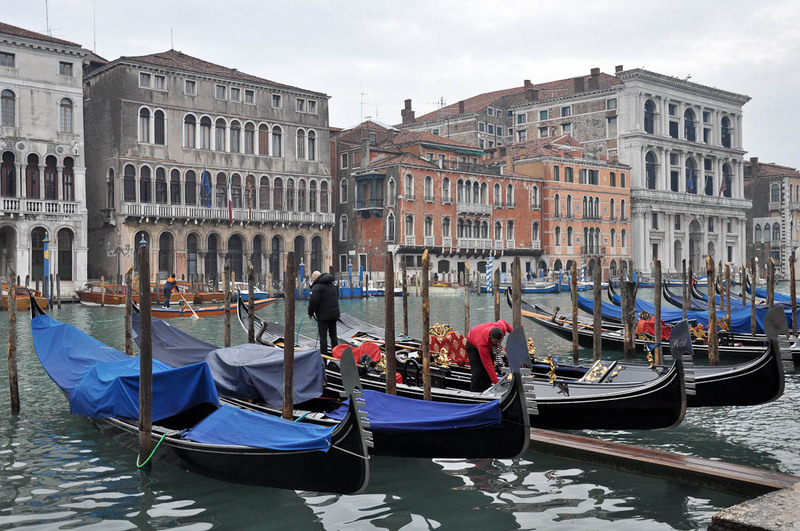 A row of restaurants is followed by a row of moored gondolas. 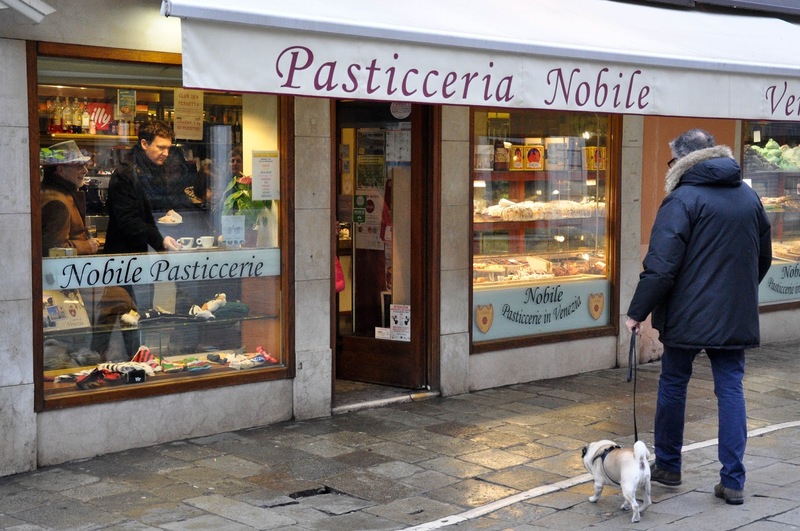 Being right in the tourist heart of Venice, the restaurants are already open serving breakfast. 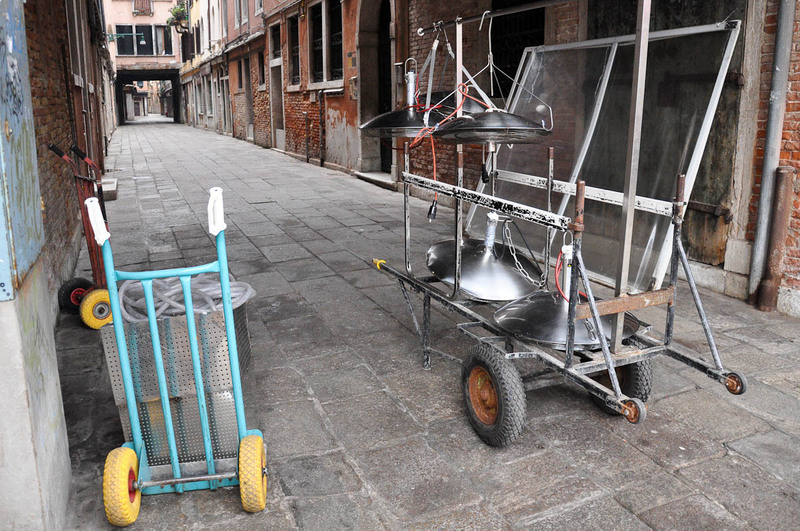 In a side street outdoor heaters piled high on a metal trolley wait patiently to be set up by the waiters. 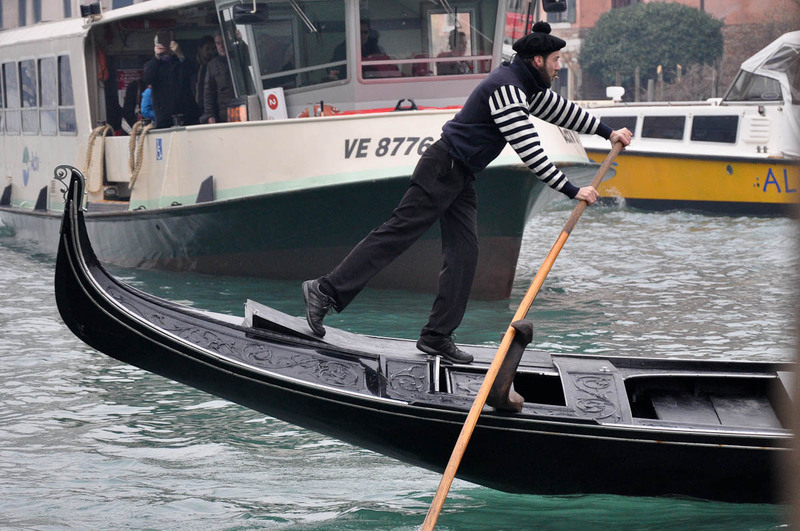 As for the gondolas, a gaggle of gondoliers is thoroughly polishing and preening them, getting ready for the busy day ahead. 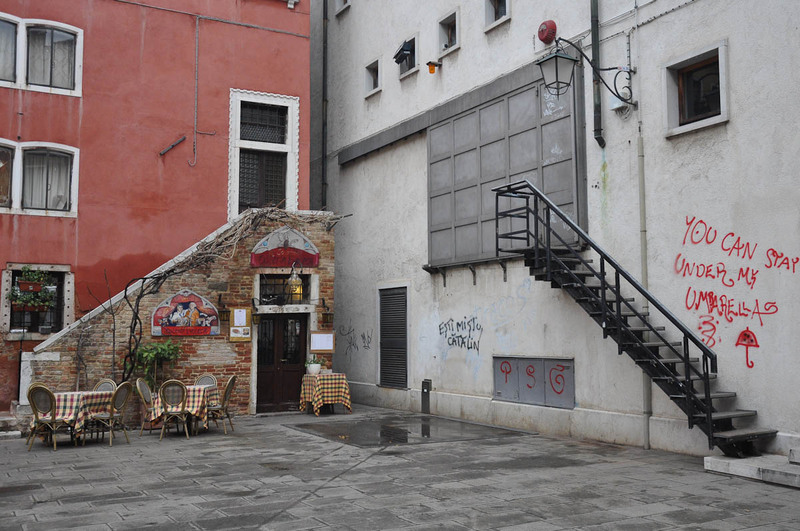 I turn back, cross over Rialto bridge and for a moment get lost in the maze of courtyards, streets and squares. It’s half past ten, time for a quick coffee and something sweet to re-invigorate me. I find a cute cafe with the most delicious array of pastries and walk in. There are no tables. Just a long bar for the patrons to lean against whilst enjoying a quick breakfast or a well-deserved lunch break. With my coffee finished, I walk back to the Grand Canal and find a nice little spot to watch the Befana race. A police boat is moored nearby. 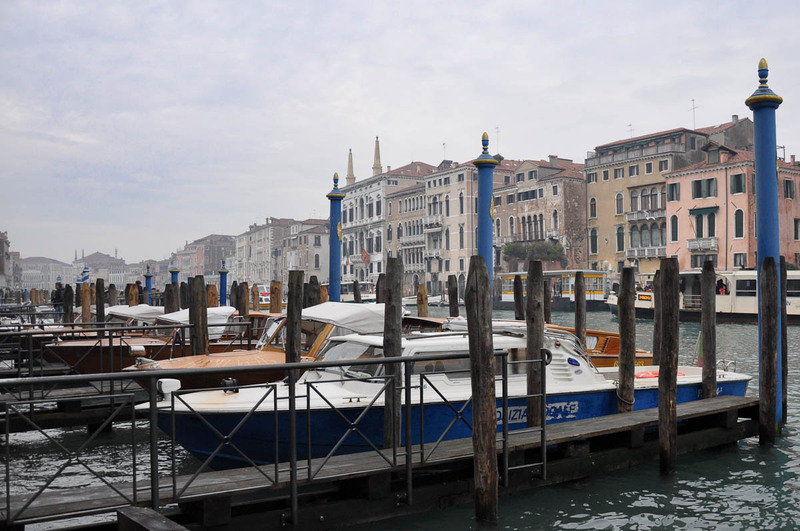 I think back to February 2013, when my fiance (now husband) and I visited Venice for the first time together and on the way to the hotel late one evening we came across a group of Italian teenagers. I don’t know what his transgression was, but when we aligned with them, one of the boys was being beaten by two of the other boys and the rest of them, clearly outraged at the former, made their approval of the latter known. It was all happening in the middle of a small square as far away as you can be from a canal in Venice. We wondered what to do and just then a group of policemen appeared out of nowhere, running towards the quarreling group. I don’t know how they managed to reach the square so quickly. Perhaps they were patrolling the city on foot. The teenagers ran off as fast as they could and the policemen gave chase, until both groups disappeared from view in the maze of small streets around us. … the locals starting to crowd on the quays and the tourists, who have materialised out of thin air, joining them and asking what was about to happen. The morning has morphed into another day in Venice and my walk has reached its end.